Over a decade ago, I walked out of the theater feeling like I had been beaten over the head with a shovel. I was dazed and speechless, but not because of the power of cinema or a narrative that was effectively hard hitting and meaningful. I was feeling the effects of a film that drilled home a single tonal note for two hours with relentless brutality, and I promised myself I would never watch that work again. The film I am speaking of was The Passion of the Christ, and I have never felt compelled to waiver from that one and done, single viewing pledge, but right now I feel as if I have witnessed its, for lack of a better word, spiritual sequel. Ten years later I felt a similar unpleasant wooziness when I tried to stand up after watching Unbroken, directed by Angelina Jolie, a work that I had assumed months ago would be a shoe in for not only a Best Picture nomination, but likely a win as well. Not only is this not worthy of award recognition, I can't find enough reasons to even recommend seeing it. Now, unfortunately I feel as if I must mention this, but I am not trying to be offensive to religion or to minimize the atrocities the subjects of these films went through. 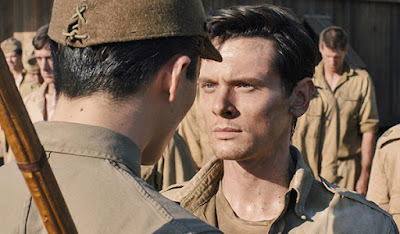 My criticisms of both The Passion of the Christ and Unbroken are not commentaries on how I feel about Jesus Christ or Louis Zamperini, but rather merely a focus on how those films failed at their attempts to tell important, powerful stories. Unbroken is exhausting to watch and it accomplishes absolutely nothing with its attempts to be an inspiring biopic, which is a shame because Zamperini absolutely deserves to have an inspiring biopic made about him. Two hours of the same beats, the same tone, and the same visual palette, and that last part is the hardest for me to criticize because I am typically a massive fan of the genius cinematographer Roger Deakins but his contribution to this film simply did not stand out like I expected it to. The film isn't a total failure and isn't worthy of the type of admonishment that I would relegate to a work that is offensively poor. Jack O'Connell is often times pretty great as Zamperini and that goes for the performances all around. The music by Alexandre Desplat is sweeping and captivating yet subtle when it needs to be, doing its best to remind us when we should be moved or inspired, something the narrative isn't able to actually achieve. Unfortunately, the direction by Jolie is clearly second rate and amateurish, as Unbroken is sorely lacking any sort of unique vision that elevates it beyond the many previous works it seems to imitate without reaching their heights. A film like 12 Years a Slave was able to balance the necessary brutality to tell such a story with a proper amount of eloquence, the talents of a screenwriter who knows exactly when to punch their audience in the gut so that the blow would undoubtedly be felt by those watching. Applying those punches constantly over the course of 120 minutes render them powerless, more nauseating than substantial and thus the film will without a doubt be given the same promise as that other movie did back in 2004. A second viewing simply will not be in the cards with Unbroken. I appreciate that Jenna, and I'm glad you enjoyed the film more than me. Even if I may not connect with something, I always root for others to get more from the experience.